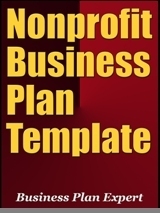 This guide features a complete Nonprofit business plan template with step by step instructions on how to plan and start your new business. This fill-in-the-blanks template includes every section of your business plan, including your Executive Summary, Company Analysis, Competitive Analysis, Marketing Plan, Operations Plan and Financial Plan. This is must-know must-do information; ignore it and you stand a good chance to fail (a similar template is sold elsewhere for $69.95). The Nonprofit Business Plan Template will help you figure out if your new business idea could actually be turned into a viable business, it serves as a blueprint for your successful startup. A wise man once said: "If you're not sure where you are going, you're liable to end up someplace else". Here are the strategies and techniques that will help make sure you're on the right track. Whether you're just getting started or you're on your way to the top, this could be the single most important investment you make in your business! The Nonprofit Business Plan Template could pay for itself, many times over, the first time you use it... and it's sure to spare you lots of costly mistakes every step of the way. Here is a free book that cover all the info you need to lower your automobile insurance costs.